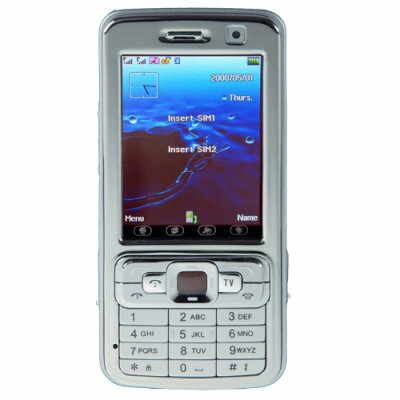 Successfully Added Quad Band Touchscreen Cell Phone - Dual SIM Worldphone (Silver) to your Shopping Cart. Unlocked quad-band cell phone with a 2.5 inch touch screen display and dual SIM card slots in hot new metallic silver finish. With native quad-band GSM/GPRS to keep you connected all around the world and dual SIM slots (with dual standby) allowing you to have two active phone numbers within the same phone, this is any frequent travelers ideal mobile phone! Of course any modern mobilephone needs to be easy to use and have plenty of PDA type productivity tools and media features, right? You better believe it! What you have here is everything you will ever need in a cellphone; modern phonebook + contact manager, easy to use keypad, TV and FM radio receivers, MP3/MP4 players, digital camera and video recorder, image viewer, portable file storage, Ebook reader, Bluetooth, and daily software tools. However, phone functionality and ease of use are where this baby shines. The display on this phone is very crisp given its compact size, and the navigation menus are simple to use via touch or the keypad. This is one phone that truly works well for both business and pleasure. The CVSC-235-Silver quad band touchscreen mobile phone is proudly brought to you by Chinavasion Electronics. Order your stock now and don't forget to sell your customers additional add-on accessories like belt clip cases, protective sleeves, and Bluetooth earpieces to maximize your profits. Quad band touchscreen cellphone with two SIM slots for worldwide business and personal use. Includes a rich software environment and multi media feature set. THIS IS A VERY GOOD PHONE, EASY TO USE AND CLEAR SCREEN.